Comanche, the innovative record-breaking 100 foot maxi yacht designed by VPLP and Guillaume Verdier and launched in 2014 for Jim and Kristy Clark, has been sold to Australian Jim Cooney. 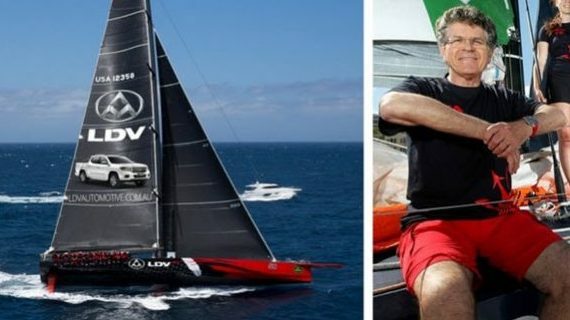 The yacht was to compete in the 628 nm Sydney Hobart Race as LDV Comanche under partnership between Clark and two-time race winner Neville Crichton, but the last-minute sale now will have Sydney skipper Cooney at the helm. “I have stepped down as skipper, we still have sponsorship for the boat, and if for any reason he can’t do it, I will step back into this shoes,” Crichton said. Crichton had assembled a world-class crew for the race – including America’s Cup skipper James Spithill and many of the men who raced her to victory in the 2015 Hobart race. The crew will stay aboard while Cooney, daughter Julia, son James and Waratah Jeremy Tilse join the crew. The new ownership means every supermaxi on the start line of the Sydney to Hobart will be racing for an Australian victory. The other three are Black Jack (previously Alfa Romeo), Infotrack (previously Perpetual Loyal), and Wild Oats XI. “How amazing that pretty much the four fastest boats in the world are now all Australian owned,” said Cooney, chairman and major shareholder of TCI Renewables, a wind energy development company.